It is very important to add dimensions (measurements) when drawing accurate orthographic or working drawings. 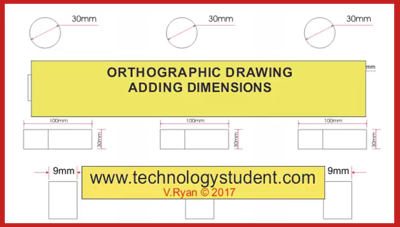 An orthographic drawing is usually the last drawing before manufacture and so dimensions must be clearly presented and understood. Dimensions can also be applied to simple sketches and designs as they help anyone looking at these to understand the overall size or scale. However, dimensions are usually drawn in a particular way and some examples are shown below. Normally at least six dimensions are placed on a working drawing. They are drawn quite faintly except for the arrow heads and the numbering which are darker. The arrow head must be sharp but above all the dimensions must be accurate. This type of dimension is normally used for a circle. The unusual symbol (zero with a line through it) is simple way of writing diameter. Curved corners can be dimensioned like this. 'R' means radius (the compass setting). Example of a standard dimension. The dimension is drawn quite faint with the exception of the number and arrow heads. If a measurement is 9mm or smaller the dimension is drawn in a slightly different way. The arrows point inwards, towards the number.